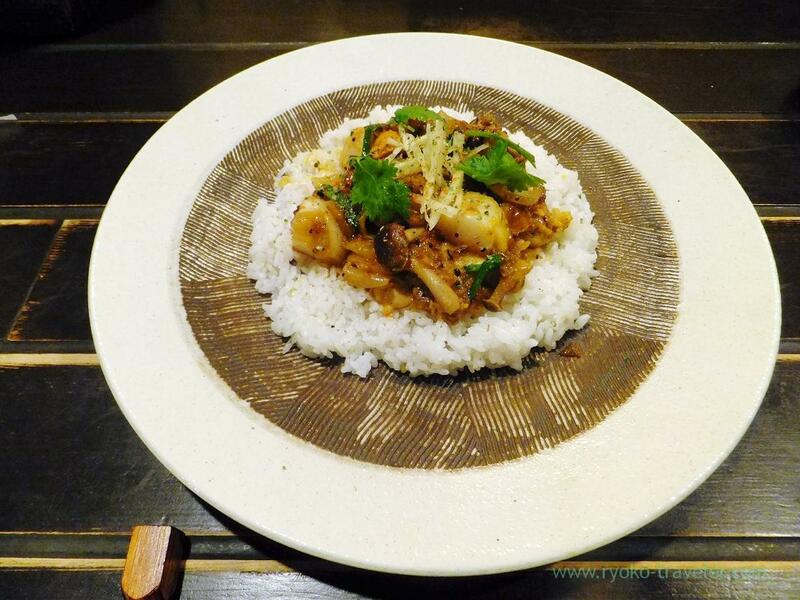 Notice : Curry no Akimbo already quit their business in Tokyo and will be open in Saga prefecture. One day, I intended going back to home directly after my work. But while my lunchtime, suddenly I wanted to go to Curry no Akimbo that is curry shop in Kinshicho. So, as soon as I finished eating my lunch, I telephoned the shop and reserved my seat. Because the shopkeeper want guests to eat his curry with comfortable, being not rushed. But the shop accept reservations, so if you come from afar, you should reserve without fail. Of course, I telephoned in advance. 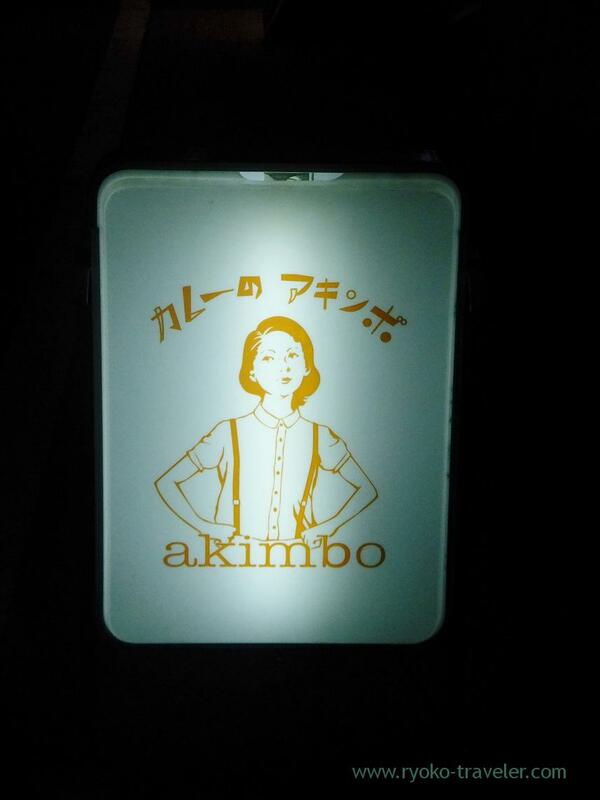 At nights, “Akimbo” serves curry and appetizer set by 1300 yen. We can’t order only curry at nights. 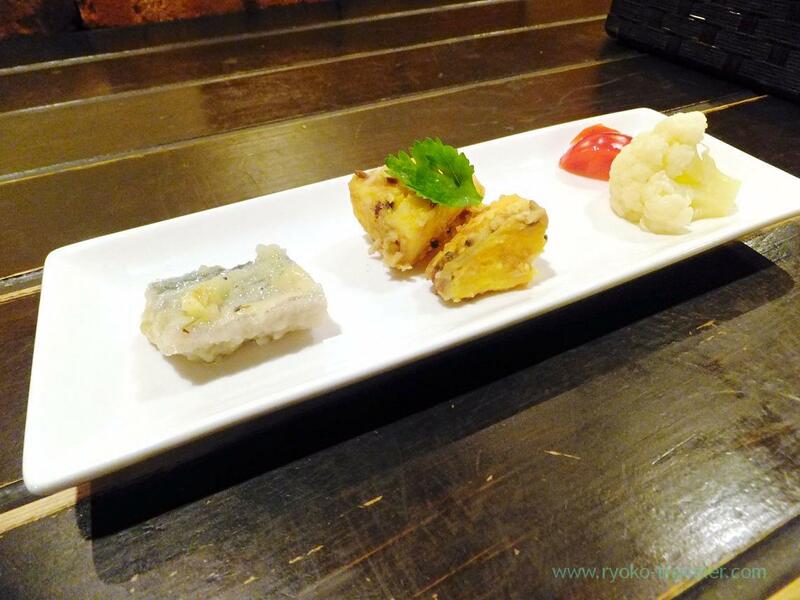 That day’s appetizer, from left to right, pickled deep fried saury, fried sweet potatos and pickled vegetables. Because I never thought to go somewhere after my work that day, so I was in thin clothes. So, I gave up drinking alcoholic drink. Nevertheless those appetizers went with alcoholic drinks very well ! We can choice our curry from three kinds of curries. Chicken curry, lamb keema curry and weekly special curry. 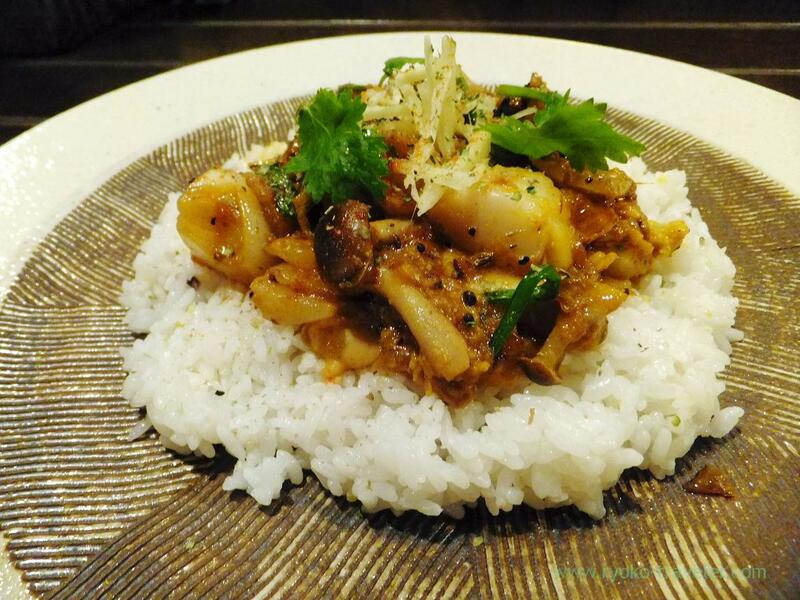 That day’s weekly special curry was scallop curry and I love scallop, so I ordered a scallop curry. 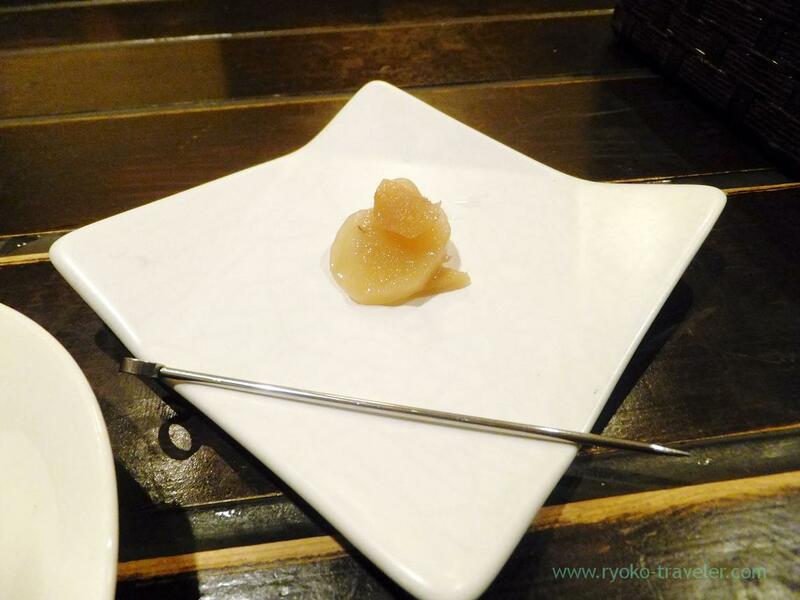 Hot spiciness, pungent taste of ginger, sweetness of onions, flavor of coriander and taste of scallop…… it had a delicate taste ! It differed from Japanese ordinary curry. Not Indian curry. Also not European curry. It tasted so good. Extremely good. And very spicy ! 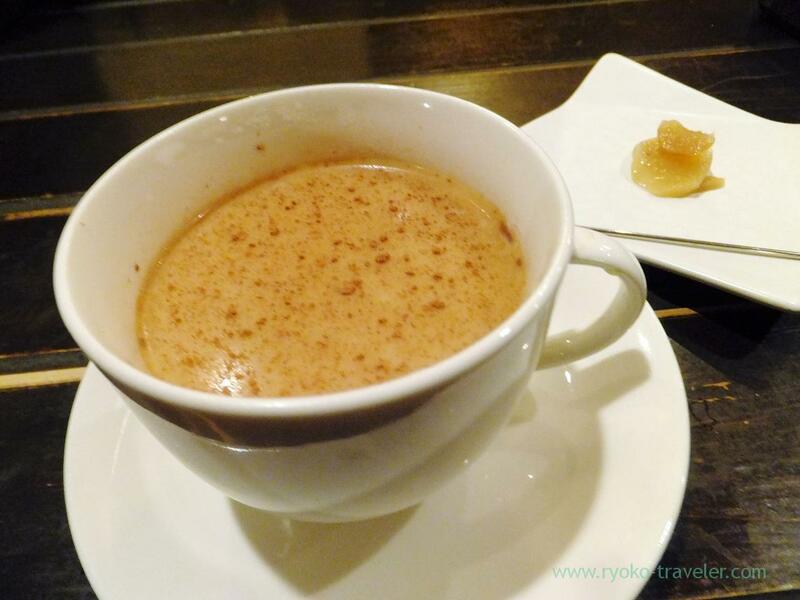 I ordered a tea with spice and milk (スパイスミルクティー, 400 yen). It had much taste of cinnamon and ginger. But it also differ from chai. Akimbo really serves high level of originality foods and drinks ! It’s pickled ginger with sugar. It came with my tea. Sweet and tasty. It went with my tea well. I went back to home with thinking of Akimbo’s tasty curry and I decided going to Akimbo again soon without fail. Thanks to effective of ginger, I didn’t feel chill very much.